Ancient hymn, familiar from its occurrence in immediate succession to the Additional Service (Musaf) at festivals, and in many liturgies on Sabbaths also. To the four titles, "our God," "our Lord," "our King," "our Savior," are successively prefixed, with the necessary particles, words the initials of which spell out the acrostic ("Amen"). Two succeeding verses commence similarly with the words "Baruk" (Blessed) and "Attah" (Thou), which are the beginning of the formula of every benediction (compare Jewish Encyclopedia, iii. 10). To make up an even number of verses there is added by the Sephardim a Biblical reference to desolate Zion; by the Ashkenazim, a reference to the incense, which is the subject of the Talmudical reading following the hymn. 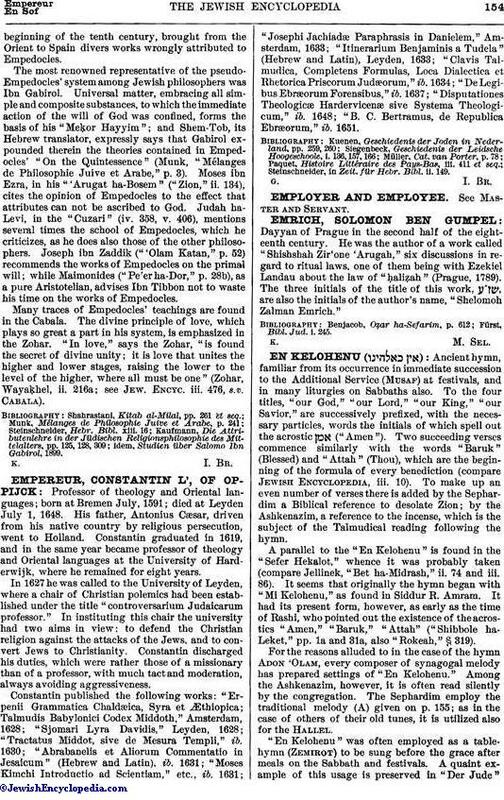 A parallel to the "En Kelohenu" is found in the "Sefer Hekalot," whence it was probably taken (compare Jellinek, "Bet ha-Midrash," ii. 74 and iii. 86). It seems that originally the hymn began with "Mi Kelohenu," as found in Siddur R. Amram. It had its present form, however, as early as the time of Rashi, who pointed out the existence of the acrostics "Amen," "Baruk," "Attah" ("Shibbole ha-Leḳeṭ," pp. 1a and 31a, also "Roḳeaḥ," § 319). For the reasons alluded to in the case of the hymn Adon 'Olam, every composer of synagogal melody has prepared settings of "En Kelohenu." Among the Ashkenazim, however, it is often read silently by the congregation. The Sephardim employ the traditional melody (A) given on p. 155; as in the case of others of their old tunes, it is utilized also for the Hallel. 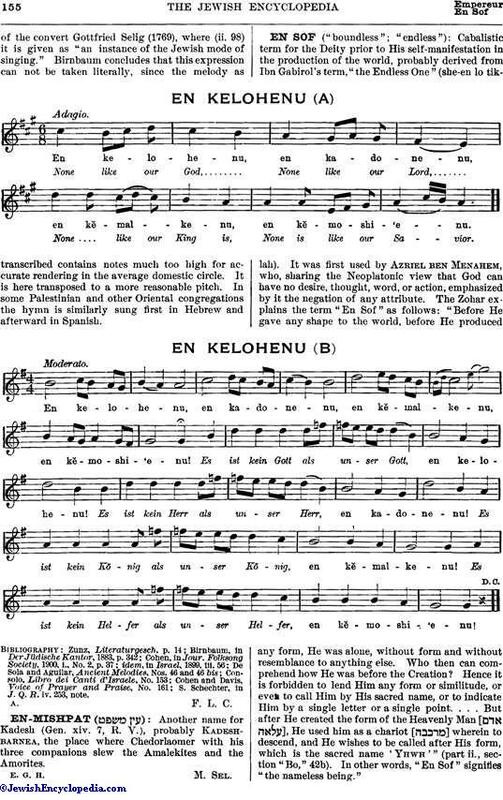 "En Kelohenu" was often employed as a table-hymn (Zemirot) to be sung before the grace after meals on the Sabbath and festivals. A quaint example of this usage is preserved in "Der Jude"of the convert Gottfried Selig (1769), where (ii. 98) it is given as "an instance of the Jewish mode of singing." Birnbaum concludes that this expression can not be taken literally, since the melody as transcribed contains notes much too high for accurate rendering in the average domestic circle. It is here transposed to a more reasonable pitch. In some Palestinian and other Oriental congregations the hymn is similarly sung first in Hebrew and afterward in Spanish. S. Schechter, in J. Q. R. iv. 253, note.